Having an active lifestyle is beneficial to your health and wellbeing. It is an effective way to prevent the development of certain lifestyle diseases caused by prolonged inactivity such as obesity, heart disease, and diabetes. However, being physically active also has its own share of hazards that you need to be aware of. The musculoskeletal system provides a framework for your body that allows for coordinated movement. Its structures include your muscles, bones, joints, tendons, and ligaments. Physical activities such as exercise and sports always include some risk of musculoskeletal injuries. Depending on the severity, these injuries could go so far as to affect your body’s mobility. According to research, ankle sprain and an acute traumatic knee injury are the most common cases of sports-related musculoskeletal injuries. A lateral ankle sprain is the most common type of ankle sprain. It happens when the foot is twisted inwards, stretching the lateral ligaments on the outside of the ankle. Its signs and symptoms include ankle pain, swelling, bruising and limited movement. In severe cases, walking might also be difficult. The immediate management of a sprain is simple enough to memorize. Just remember the acronym R.I.C.E. R – Rest. Your immediate action after sustaining a sprained ankle is to rest the injury. If you continue playing or working out, your injury might get worse. I – Ice. Apply ice on the painful and swollen area. The sooner you apply ice, the better. Icing your feet will help reduce the inflammation and thereby reduce the pain and discomfort. C – Compress. Immobilize your ankle by wrapping it with an elastic bandage. 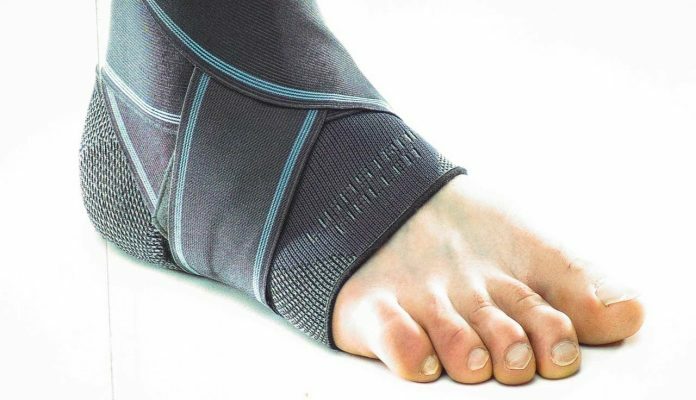 Immobilization is important to prevent the damage to your ligament from worsening. E – Elevate. Raise your ankle above the level of the heart. Keeping it elevated would reduce the swelling through the help of gravity. Muscle strain, sometimes called muscle pull, occurs when the muscle fibers are stretched beyond their usual range. The severity could range from a minor tear involving a few muscle fibers to a complete rupture which could take several months to heal. Your hamstring muscles are located at the back of your thighs. They are usually strained during sudden change of direction or when players sprint. Signs and symptoms of a hamstring strain might include pain (aggravated by movement), swelling, muscle spasm, muscle weakness, and bruising. A limited range of motion might also be present. If you sustain a muscle strain, remember the acronym P.R.I.C.E. P – Protect. Make sure that the affected muscle is protected from further injury by limiting further movement as much as possible. Look for a place where you could attend to your injury. R – Rest. Limit the movement of the injured muscle. Avoid doing the same activity that caused the injury and others that might provoke pain. I – Ice. Apply ice on the strained muscle to prevent further swelling and relieve pain. C – Compress. Wrap the injury with an elastic bandage to provide support and temporary immobilization. Any additional movement might worsen the tear in the muscle fibers. Be careful not to apply your bandage too loose (because it would offer little support) nor too tight (it might impede blood flow). E – Elevate. Prop up the injury to decrease the swelling. If your ACL tears, you might feel a popping sensation in your knee, followed by severe pain. Swelling might begin immediately to a few hours after the injury. You might also feel some instability when putting weight on your injured knee. When managing ACL injury, the same P.R.I.C.E. principle and first aid technique listed above apply. No amount of basic first aid measures, however, can replace a comprehensive medical evaluation by your doctor or sports therapist. The extent of musculoskeletal injuries cannot be determined based on what you see on the outside alone. In severe cases, surgical interventions might even be necessary. “Ligament Repair.” Johns Hopkins Medicine, www.hopkinsmedicine.org/healthlibrary/test_procedures/orthopaedic/knee_ligament_repair_92,P07675.